Adding a new contemporary language to The Beach, Lakehouse Beach Residences is settling into one of Toronto’s most established neighbourhoods. Architecture studio RAW has created a striking yet intimate condominium that presents floating glass enclosures of increasing size one inside the other. Contemporary glass walls are surrounded by smaller elements of masonry brick and ipe wood that mimic the scale and character of The Beach neighbourhood. 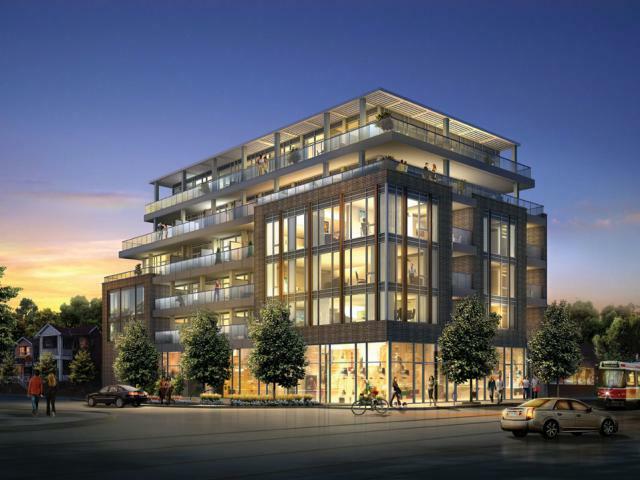 “While design forward, Lakehouse settles into the neighbourhood quite well,” says Andrew Brethour, Toronto real estate expert and President of PMA Brethour. Tucked cleverly on the corner of Kenilworth Ave. and Queen Street East, Lakehouse represents a decidedly urban and design forward alternative to traditional condo living. “Rather than replace the existing fabric with a high rise development, Lakehouse adds density while preserving the context of its surroundings,” says Shane Fenton, VP of Reserve Properties. Reserve’s keen ability to acquire highly desirable locations on some of the city’s hottest streets has allowed them to develop a reputation for forward thinking urban mainstreet projects. From the sell-out success of Bellefair, which converts a former church in the heart of The Beach, to Motif Lofts and Towns on trendy Ossington Ave., and several others in the pipeline, the blended intuition of Reserve Properties’ father-son team is changing the landscape of Toronto. “We enjoy working together and bringing our combined passion to the neighbourhoods we work in,” says Shelley Fenton, President, Reserve Properties. In keeping with the spirit of The Beach, Lakehouse suites feature some of the largest outdoor living spaces in the city with grand luxurious terraces and wrap around balconies up to 1058 sq. ft., creating a seamless blend of indoor and outdoor living space. Lakehouse’s modern structure allows for terraces on upper floors to be set back and framed, “to feel more like outdoor rooms,” says Roland Rom Colthoff, Director, RAW. Lakehouse interiors are tailored for the refined tastes and individual styles of The Beach homeowner. In a neighbourhood where every front porch stands out from the next, Lakehouse offers 16 unique spacious floor plans in a boutique residence of only 28 units. With one and two bedroom open concept floor plans ranging from 550 sq. ft. - 1880 sq. ft., contemporary high-end Interiors by II by IV Design Associates include; Scavolini kitchen cabinetry with integrated and stainless steel European appliances by AEG and Leibherr, bathrooms featuring luxurious deep soaker bathtubs and frameless glass showers. Balconies and terraces all feature gas BBQ connections. “We know from our last project Bellefair, that the majority of purchasers are from the community. So we designed everything about Lakehouse for the people who want to live in The Beach,” says Shane Fenton. Echoing the residential greenery that surrounds it, Lakehouse residents are welcomed to their lakeside home with a soft landscaped promenade leading to an intimate entrance on Kenilworth Ave. Lakehouse also boasts enhanced retail along Queen Street East that opens up to the neighbourhood’s vibrant mainstreet.